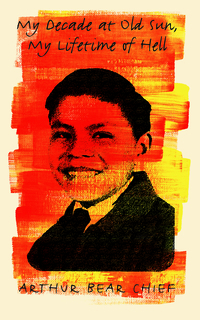 Arthur Bear Chief suffered both sexual and psychological abuse during his time at Old Sun Residential school in Gleichen on the Siksika Nation. My Decade at Old Sun, My Lifetime of Hell is a of chronological vignettes that depict the punishment, cruelty, and injustice that Arthur endured at Old Sun and then later relived in the traumatic process of retelling his story in connection with a complicated claims procedure. Late in life, after working for both the provincial and federal government, Arthur returned home to Gleichen. It was there that he began to reconnect with Blackfoot language and culture and to write his story.